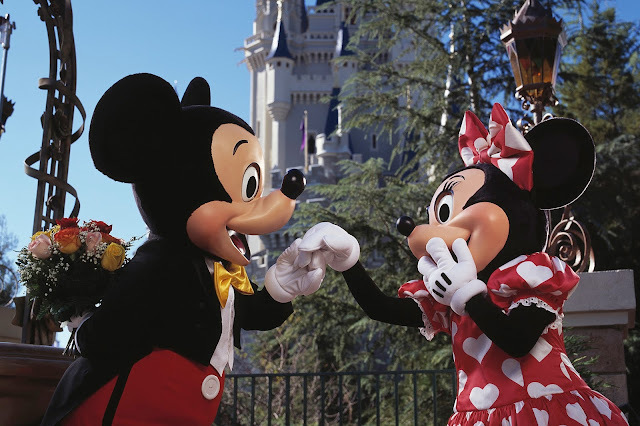 Celebrate love with your significant other on Valentine’s Day and every day at the most magical place on earth, Walt Disney World Resort. Throughout the 40-square-mile playground there’s simple and luxurious splurges for couples of all ages — from moonlit strolls and stolen kisses aboard attractions to pampering spas and intimate dining for two. The four Walt Disney World theme parks and 26 resort hotels create a perfect setting for spontaneous romance. Gazing at dazzling fireworks, a surrey bike ride for two at Disney’s BoardWalk Inn & Villas Resort, or a leisurely swing beachside at Disney’s Beach Club Resort, couples can embrace a bouquet of romantic experiences. The Couple that ‘Spas’ Together… – What’s more enjoyable than a luxurious spa treatment? Imagine sharing it with that special someone. The Senses – A Disney Spa at Disney’s Grand Floridian Resort or Senses – A Disney Spa at Disney’s Saratoga Springs Resort, both feature a “couples room” where guests can enjoy specialized spa treatments – such as massages and facials – with the one they love. For information about spa treatments, call 407/WDW-SPAS. Make like Aladdin and Jasmine – Fly through the sky with your special someone on an adventurous tandem parasail over Bay Lake. Those looking to soar to new heights can spend 10 minutes soaring high above Disney and get a bird’s-eye view of Magic Kingdom and its neighboring resorts. Contact Sammy Duvall’s Watersports Centre at Disney’s Contemporary Resort, or call 407/939-0754 for reservations for a tandem flight. Sunset in the Sky – A very different kind of flight is aboard a tethered balloon rising gently into the Florida sky. Located on the waterfront at Disney Springs, Characters in Flight gives romantics a chance to take their love to new heights. Operating daily, the giant balloon provides breathtaking sights from 400 ft. up in the air with an unparalleled, 360-degree view of the Vacation Kingdom and beyond. Flights take place between 8:30 a.m. and midnight (weather permitting) and last approximately 8-10 minutes. Romantics who time their flight to sunset or fireworks bursting above the parks are in for a special treat. Tickets can be purchased at Disney Springs West Side; tickets are $12.00 per child and $18.00 per adult. Magical Resorts – From the tropical splendor of Disney’s Polynesian Village Resort to the Victorian era of Disney’s Grand Floridian Resort & Spa, the mood is set for an enchanting stay at a Walt Disney World resort hotel. Disney’s fantasy hotels transport couples to faraway places with lavish theming, picturesque views and superior service. For reservations, guests may call 407/W-DISNEY (934-7639) or visit DisneyWorld.com/resorts. The Love Boat – The Grand Floridian’s Grand 1 – an elegant 52-foot yacht – can give couples, or parties up to 18, a stunning view of “Wishes” fireworks showering above Magic Kingdom during select evening cruises along Seven Seas Lagoon and Bay Lake. Private butler service and gourmet meals also are available. Romantic evening cruises include a captain and private deck hand. Reservations may be made up to 90 days in advance by calling 407/WDW-PLAY. Callers to that same number can ask about Magic Kingdom or Epcot fireworks cruises aboard gently floating pontoon boats. To turn up the romance, lovebirds can order up champagne and chocolate-covered strawberries for their fireworks viewing. Disney Dining Serves Romance – Couples find Disney dining infused with romance in settings ranging from subdued to spectacular. Indulge in a romantic dinner for two at California Grill atop Disney’s Contemporary Resort. Situated on the 15th floor of the resort, the onstage, market-inspired kitchen boasts breathtaking views of the Magic Kingdom, Seven Seas Lagoon and nightly fireworks. The menu is creative, seasonal, sophisticated and fun. Beneath shimmering chandeliers, lovebirds can dine in fairy tale elegance at Be Our Guest Restaurant in New Fantasyland. Known as the place where Belle and Beast fell in love, the grand ballroom in Beast’s Castle is the perfect setting for romance as ‘snow’ falls on the French countryside outside the windows and guests dine on French-inspired cuisine and fine wines. One of the most romantic dinner spots at Walt Disney World Resort is a table for two at Victoria & Albert’s at Disney’s Grand Floridian Resort & Spa. The elegant restaurant has been honored with the Five-Diamond Award from AAA for its gourmet cuisine. Combining Royal Doulton china, Cristofle silver and personalized menus, Victoria & Albert’s is the “crown jewel” of the Grand Floridian’s dining destinations. Soft harp music fills the air in the intimate dining room. Ladies also receive a long-stemmed red rose. For the ultimate romantic experience, an evening at the Chef’s Table is unsurpassed. Couples are seated at a cozy table in Victoria & Albert’s kitchen and treated to a culinary feast custom-tailored to their palates by Chef Scott Hunnel. Guests who prefer to dine in an even more intimate setting at Disney’s Grand Floridian Resort & Spa need only to pick up the closest telephone. The Grand Floridian can arrange a private dinner for two, served against the elegant backdrop of the Grand Floridian beach – or aboard the Grand 1 – on a sunset excursion along Seven Seas Lagoon and Bay Lake. Certain menu items can be specially prepared for the evening. Seven-day notice is requested. There’s nothing more romantic than a champagne toast with classical French cuisine. Monsieur Paul restaurant at the France pavilion at Epcot pays homage to one of France’s most celebrated chefs, Paul Bocuse with upscale French creations. The second floor vantage point of the newly redesigned restaurant offers stunning views of the nightly IllumiNations fireworks display. For all Walt Disney World dining information, guests can call 407/WDW-DINE (939-3463). Nature Lovers – A horseback ride through one of the backwoods trails at Walt Disney World Resort is just the thing for couples who share a love of nature and each other. Disney’s Fort Wilderness Resort & Campground offers wrangler-led tours (45 minutes) through the deep, pine-scented woods that make up part of the Vacation Kingdom’s 40 square miles. Tours leave several times daily from Trail Blaze Corral, and may be reserved by calling 407/WDW-PLAY (939-7529). Romantic Evening – Horse-drawn carriage rides through the wilderness of Walt Disney World Resort are a romantic treat for couples looking for a secluded nighttime outing. The antique carriages depart from Pioneer Hall at Disney’s Fort Wilderness Resort and Campground and traverse throughout the scenic landscape of the 750-acre rustic resort. Or guests can choose a relaxing old-fashioned carriage ride through Disney’s Port Orleans Resort-Riverside with pickup at Boatwright’s Dining Hall. Each nightly excursion is 25 minutes long. For reservations, guests can call 407/WDW-PLAY (939-7529). Weddings Around the ‘World’ – The epitome of Disney romance can be summed up in four words: Disney’s Fairy Tale Weddings. Since the first wedding at Disney’s Wedding Pavilion in 1995, more than 1,000 couples each year have exchanged vows at Walt Disney World Resort. For these couples, dreams become reality. Where else but at Disney could a bride arrive for her wedding in Cinderella’s glass coach, have a handsome major domo carry wedding rings to the altar in a glass slipper, or have Mickey and Minnie greet guests at the reception? Whether it’s an elegant ball at Disney’s Grand Floridian Resort & Spa, a traditional ceremony at Disney’s Wedding Pavilion or a beach-themed wedding complete with tiki torches, leis and luau on one of the Walt Disney World white-sand beaches, Disney custom designs each wedding with the famous “Disney Difference” – providing attention to the tiniest detail. For more information on Disney’s Fairy Tale Weddings, call 321/939-4623 or visit disneyweddings.com. Renewing Vows – Many couples who’ve been married for years are coming to Walt Disney World Resort, often with their families, to renew their vows five, 10, 25 and 50 years later. A Disney vacation provides the perfect backdrop to celebrate this family milestone. Disney’s Fairy Tale Weddings experts can tailor the ceremony and celebration to suit each couple.